Replies: 75 (Who? ), Viewed: 94374 times. NOTE: the "Classic" Object Workshop is now called "Windowed OW" and is considered obsolete; starting from SimPE v.58, the old "Windowed OW" is not available any more. The following information are related to current SimPE version 0.56, released on 13 MAR 2006. This is the main (only) option: if unchecked, SimPE will create an empty package. Usually this option is not available: it's an option that Quaxi implemented primarily for RGiles and me in order to create the CEP. You shouldn't see it at all, and if you see it, never check it! It will alter/corrupt your CEP files! When checked, SimPE will assign all the scenegraphic files (formerly: "RCOL files") to the special Group 0x1C050000, that Maxis has reserved to the modding community. All the other files will be assigned to the Private Group 0xFFFFFFFF. If unchecked, all the original groupID assignments will be preserved: it's useful only for study/testing purposes, because the clone won't work correctly in the game. When checked, SimPE will automatically invoke the Scenegraph Rename Wizard, that will let you give a unique ModelName to your object; SimPE will also perform a "Fix Integrity" on the package, merging the LIFOs into the TXTRs and doing a lot of other things that we can't discuss here. Again, unchecking this option is useful only for testing purpose: the resulting object won't work in the game. This option is only available when the previous one is checked. Most of its functions has been included in the Fix Integrity routine; nowadays, it only remove some useless Material Overrides from multi-model objects clones (e.g. fireplaces...). If unchecked, these useless files will remain in your clone; since they are useless, they will be simply ignored by the game, but will nevertheless waste resources, so keep this option always checked. This option will remove all the translations in the text references (e.g. the object description, the text messages, etc.). Object Workshop will retain the text only from the default language, i.e. the one you have chosen when you installed the game (that should always match the language set in SimPE Preferences, to avoid unexpected results). If you have created a new object and plan to provide the description in English only, leave this option checked: the file size will result consistently decreased. Uncheck the option if your object will contain text references in multiple languages. This option is important only for original objects that "borrow" the textures from other objects: beds, armchairs, curtains... A complete list of object of this kind can be found in the "CEP3_Objects_List" file, downloadable from the CEP thread. By default, this option is unchecked: all the external links are preserved, and therefore the cloned object will borrow the textures from the external object. If checked, all the external links will be broken, and the external textures will be included in the package. This can be useful in some cases (e.g. if you are cloning a table lamp originally linked to the corresponding floor version), but may lead to troubles (if you create a stand-alone bed, it will not use any more the common beddings). My suggestion is always to start with the option in its default unchecked state; in case the clone doesn't work correctly (e.g. it doesn't use the custom textures you've prepared for it), then try re-cloning the object with this option checked. If checked, SimPE will include in the clone only 1 recolour for each recolourable subset; in particular, SimPE will choose the recolour that is marked "True" in the corresponding Material Override. 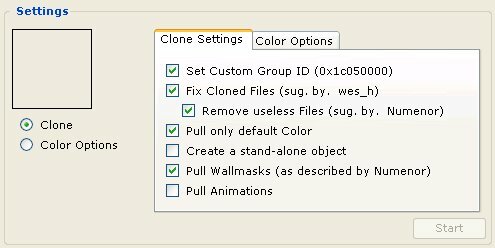 If you uncheck this option, all the existing Maxis recolours will be included into the clone, and all the custom recolours you have installed in your downloads folder for that object (the custom recolours are pulled only if the Downloads folder was added to the FileTable, in the program Options). This option should be left unchecked, otherwise cloning e.g. a bed, you'll end up with a clone that contains all the bedding textures. On the other hand, more experienced users can uncheck this option in order to create a multi-texture object (an object that contains multiple alternative recolours). This option is useful when cloning doors, windows and arches. The "Wallmasks" creates a "hole" in the wall when you place a door/window onto it. When the option is checked, SimPE will scan the game packages in order to find any wallmasks related to the object that is being cloned, and will include them in the clone. If you are not cloning a door/window/arch, SimPE simply won't find (nor include) any wallmask, so you can always leave this option checked. If unchecked (when cloning a door/window/arch), no wallmasks will be pulled, and the resulting door won't cut any hole in the wall; but the door will still be usable, so unchecking this option may be useful to create hidden doors. This is quite self-explanatory. When checked, SimPE will pull any ANIM files related to the original object: it's useful only if you are planning to actually edit the animations; if it's not the case, leave the option unchecked. When checked, SimPE will include in the clone the additional materials referenced in the STR# 0x88 (that lists the alternative textures used in multi-state objects: lit/unlit and clean/dirty): if you are cloning a lamp, a counter, a plumbing item or anything that gets lit or dirty, be sure to keep this option checked (it won't hurt leaving it always checked, even for non-multistate objects). This option is usable only when cloning fences, walls, floors and roofs. Since these architectural elements can't be "recoloured" like a normal object, you need to create a sort of clone, in order to add a colour option to them. When checked, OW will create a clone without the data related to the mesh: the original (Maxis) mesh will be used ("referenced"), instead. Uncheck the option to include the mesh in the resulting package, if you are planning to create a custom mesh for your fence. IMPORTANT: the "recolours" created using this option will NOT work with the base-game (i.e. without an EP installed). This option will instruct OW to open a special window, at the end of the cloning process, where you can edit the name, the cost and the description of your new object. IMPORTANT: when checked, this option will allow you to edit the description in the default language, and will remove all the other translations (no matter the state of the "Remove non-default languages" option explained above). Uncheck this option to keep the original description, name and cost. Thank you very much.. this should help me tremendously! thankyou Numenor for your time and effort on this thread, it is extremely helpful and concise. This message has been deleted by Inge Jones. Could a moderator please undelete my previous message - I realised it was correctly posted after all. But the forum software won't allow me to either undelete it or repost it. Thank you for this. I always have an easier time understanding, when I know the reasons for the steps I'm making in any project. 27 JULY - The front page has been updated to include screenshots from the new GUI version os SimPE (v. 0.42). I don't think that the Object WorkShop dock will be avalible until v 0.44 is officially released. However you are giving an awesome SNEEK-PEEK of what is to come. I just thought I would add this so you don't get bombarded with posts asking how to make Object WorkShop use the NEW look. I think I'll edit a little the explanations in the front page. Thanks for the heads up! Fix Cloned Files .. hmm i wonder how well this will finaly put a damper on faulty food files? anyways thanks for the sneak peak! Thanks for the helpful information and the sneak peek. Can't wait to get .44! So far I love the new version of SimPE. I was playing with 44 for a little while and thought it was best to go back to 42. At any rate I thank you for this Numenor. Just a few questions - not sure where to ask. I find that some objects do not show up in the game when I recolor. When is it appropiate to clone? What is the format for naming clones? Do we need to include the original objects makers initials? Do clones require new GUIDs? Thank you for all your help and tutorials!! If you create a recolour, you won't find it in the catalogue as a stand-alone object: e.g. if you recolour the potty chair, you have to select the original potty chair from the catalog, and once you have clicked on it, your recolour will be shown as colour option, along with the original red colour. Cloning is appropriate only if you want to create a brand new object: e.g. a square potty chair. In this case you have to clone the original potty chair and register for it a new, unique GUID. As for the naming, when you clone an object you are first asked to rename the so-called "Scenegraph chain": in the Scenegraph Rename Wizard that open up while cloning, you can either accept the suggested name, or give a custom unique name (I suggest MyName-UniqueObjectName: e.g. "Megahue-SquarePottyChair"). When you are asked to save the package, choose the name you like (again, I suggest to include your name or initials and the custom object name: e.g. "Megahue_SquarePottyChair.package"). Lastly, you ask about the "original object maker initials": if you are going to recolour a custom object created by another user, yes, I suggest to include the creator name or initials (e.g., if you create a blue recolour for Numenor's Square Potty Chair, you can call your package "Megahue_NumenorsSquarePottyChair_Blue.package"). If you are going to clone an object created by another user, then don't do it: most creators, including me, don't like at all having their objects being cloned; ask permission, first. Thank for answering and for all of the information. I found a counter on another website and try as I might I can not recolor it. It never shows the new color in the catalog under the original counter. The site said free to recolor or clone. Any suggestions? Is that counter posted on a free site? If so, would you please provide a link to it? If it's a paysite, I can't check (and obviously you can't post the counter here ). It's a pay site! Thanks anyway! Is there any other way I can get some help on this? Only asking for support to the creator. After all, it's a pay site: if they don't give support, why should they deserve your money? Nixie, in the rar archive you'll find, in addition to the main Excel file, three text files in .rtf format (readable with WordPad) that contain the same info as the Excel sheet. I am in the process of making a new mesh and using the "Sims Cityscape" as a base because it gives you the option to mix and match different paintings with different frames. This is a 2 tile object and requires three GUID's. When I create my mesh, I register for three new GUID numbers. Then I go through the process and create my new mesh. When I go into the game, the painting is there, BUT in the catalog in the game, it shows only a picture of the painting, it does not have the option to mix and match. When I create a recolor for it, it too is also not showing up in the catalog. I did check the Material Override in the recolor package, and it is the same number as my LAST GUID number (SimPE puts that number in). I did try both checking and unchecking the "Pull only defalt color" in the cloning options, but I still had no luck with it. When I make 1 tile ojects, they work fine, I have all the color options, but anything 2 tiles or over, I have no options. Looks like I'm missing something, but I'm not sure what. "Remove non-default languages from References" - Default: checked This option will remove all the translations in the text references (e.g. the object description, the text messages, etc.). 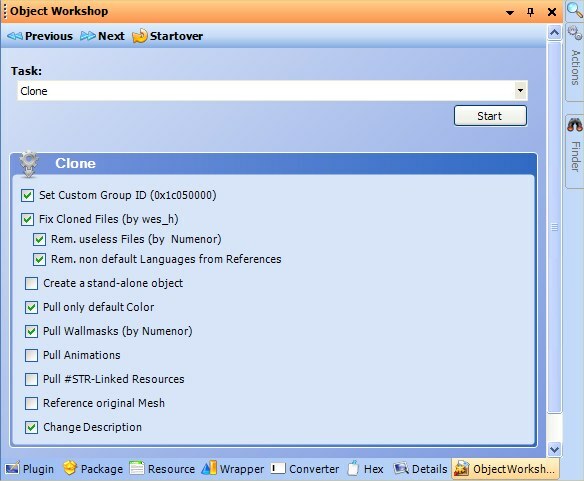 Object Workshop will retain the text only from the default language, i.e. the one you have chosen when you installed the game (that should always match the language set in SimPE Preferences, to avoid unexpected results). If you have created a new object and plan to provide the description in English only, leave this option checked: the file size will result consistently decreased. Does this mean that when I check "Remove non-default languages from References", if I give the object a description in English, it will show up in English in everybody's game regardless of the language of their game, or will people that games are not in English get no custom description at all? Yes, exactly. This option is useful for cloned objects, because usually the creator only edits the English description. Without this option, in this case, an Italian user would read the original italian description. With the option activated, the Italian user will read the new English description. You can always check this option and then manually add one or more localized descriptions, if you like. E.g., if you release your object with the description in English and Italian, all the users except Italians will read the English one; but Italians will read the Italian one. Simnuts - Check again the GUID into the Material Overrides: it must match the one of the "main" OBJD (i.e. the one without "0,0" or "1,0"). You didn't change the names of the meshes, did you? The name of the "models" in the GMDC should be "paintinghorizontalcity_city" and "paintinghorizontalcity_frame". Thank's for the quick reply! Well, now I'm very confused. What I did is I started right from scratch again. The only thing I noticed is that when I imported the mesh into SimPE the "k" from paintinghorizontalcity_canvasback was missing, so I corrected it and added in the "k", committed and saved. I got unique GUID's, and I see what you mean by the "master" GUID file name not having 0,0 or 0,1. Now when I redid everything, the mesh showed up properly in the small preview window in SimPE. This is the confusing part, when I went to re-color the mesh, I loaded it up, gave the re-color a new name, but the subset selection comes up blank and sits there. So I can't try to re-color the object now. I currently have SimPE v0.48.2087.35611. I have also attached the file for you to look at if you have the time. The mesh does show up in the game, but with no color options available in the catalog. Again, thank you for your help, I'm not sure what I'm doing wrong. Oh, I did also try this with the clone options checked and unchecked for "Pull Default Color" with the same results. 001simnuts101painting05_mesh.package 217,439 "SimCity at Night"
Renowned painter Bart Alay said of this work: "I wanted to capture the beauty of the City at night, explore its permanence even in the face of its mutability." Its cosmopolitan verve will more certainly bring an urban feel to the suburban home. simnuts101, I think I was able to fix your painting. The problem was in the Material Overrides with some file names, they were not pointing to the correct modelNames, names and subsetNames. Maybe open both the previous and new versions of the painting in different instances of SimPE and compare the Material Overrides side by side. You also had two extra Material Definitions that I deleted. Now when I set to recolor the painting, I get the options show up correctly. I'm still too new to this to exactly explain why these changes fixed your painting, but maybe someone else can give you a deeped explanation *lol*. I don't know exactly what I'm doing and why, just trying on a hunch. 001simnuts101painting05_mesh.package 214,158 "SimCity at Night"